At the end of last year Sura and me actually planned ahead and booked tickets to see our lovely friend B. We had decided to fly as a 5 hour trainride seemed a bit of a challenge. This would turn out to be a bit of a saving grace with all the snow, even the fact that we flew to Prestwick which isn’t even near Glasgow turned out lucky as all other flights to Scotland were cancelled. So far so good. As it was just an hour flight and we were just staying for a long weekend, we decided to only take handluggage and save ourselves the £20 that bloody Ryanair seems to charge for every bag you check in. It was going so smoothly: what could possibly go wrong? Ah. Now. Since 9/11 we have had to deal with the 100ml rule: you are only allowed to take 100ml of fluids in containers which you need to carry in a clear plastic bag. Sura has a half-full 200ml bottle of make-up remover and takes this to the security check. Spot the mistake. Funnily enough she was allowed to decant the branded make-up remover in a clear 100ml bottle and take the 200ml bottle with her. This obviously doesn’t make sense but as we were expected on the other side of the flight this was not followed up upon until…the flight back. So now as part of an experiment, she tries half filled 200ml bottle again, no she is not allowed to take it: she has to decant it. Sura does this with glee in front of the man and this is the point where I can smell what is coming. Because she is again allowed to take the empty original bottle, so she takes it to the other side of the scanner and starts to re-fill the 200ml bottle. Now, this is Prestwick – I hadn’t heard of it either – on a Monday night 10pm. We are the only ones going through security. My friend is blond, Caucasian and beautiful. Yet the female officer isn’t having it: Sura is not allowed to decant it back because this would be a security risk. The man who initially let her through is now backtracking, claiming she wasn’t allowed to take the 200ml empty bottle even though he was happy to let her through 60 sec ago. Everyone is outraged, does she know what damage it could do to a plane? Erhm make-up remover? No never really thought about it, could they explain? That was not the point! What if everyone did the same thing and took 10oml of make-up remover in a 200ml container? She could mix it with anything in that 200ml container, god she should really hand it in…. Lalalaaa…. After a couple of minutes of utter inadequacy security side who didn’t even confiscate the potentially dangerous liquid, Sura relents and starts to slowly pour everything back into the 100ml container…The female officer even brings some tissue as she is spilling a few drops on the side. I can see the glint in her eye, I tell you she has a strange sense of humour. We walk through security with unlabeled clear liquid in our clear bag and spot all kinds of ‘containers’ we can buy tax free to mix and match any dangerous chemicals in. From drinks to cosmetics, all these things we can pour down the toilet ( or drink so not to waste anything), pour our unlabled 100ml liquid in – of which we can take up to 10 bottles of that will make 1l ladies and gentlemen and take on our flight. Sura was still muttering away as we sat down in the departure lounge and she opened her handluggage to put away the clear plastic bag. There, on top of her folded clothes, lay the actually accidently forgotten bottle of cough syrup – arguably the most chemical liquid we had between us- in an opened bottle of 120ml. My first love wasn’t the boy who I stalked through primary school to secondary school when he finally gave in and gave me my first kiss – that was just a project (and in the end just proof of stamina.) It wasn’t AJ from the Backstreet Boys, though that did turn into a strange obsession ( I personally blame youth). It also wasn’t John Lennon whose music and writing I grew to love. No, my first love was Elvis Presley. If you don’t believe me, you should see my childhood bedroom and admire the pictures and the calenders on the wall. This Friday Elvis would have been 75. There is 49 years and 11 months between us, which would have complicated a relationship as well as the fact that when my infatuation started he had been dead for over 20 years. Still I loved his voice, the way he laughed ( I had a CD with outtakes that never made it to previous records because he started having hilarious laughing fits) and the way he sang. I had never seen him on film when I first heard his voice and I was sold. Because first love never dies I decided to watch the special that the BBC broadcasted earlier this week: Elvis, by the Presleys. It was an interesting and very candid portrait pictured by his friends and family; specifically his ex-wife and his daughter. Priscilla who still looks scarily young, which she is – yes mother I agree 65 isn’t old- and Lisa-Marie who is just the spitting image of her dad in female form discussed the part that Elvis played in their lives. 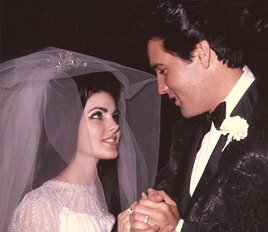 What struck me most is how unlikable the husband Elvis was, especially to a 21st century woman. He was old-fashioned, liked his women pretty and quiet; he very much controlled his wife, whilst hanging out with the boys enjoying the bachelor life. Priscilla was still in her teens when she came to live with him and he was ten years older. She clearly adored him, very much stepped into his life and had to go with his flow. There is one part where Priscilla explains that Elvis also had his vulnerable side away from the crowds and his friends, the so-called Memphis maffia, and it was that side she loved. ( The fact they had baby-talk and she wanted to mother him really was a little TMI – somebody should have talked to the editor.) Overall their life at Graceland was described as one big party: his party. A portrait is made of a nice young man, who did well and who shared his wealth generously with people he cared about. He could be silly, vulnerable, searching for the meaning of life but he mostly hid it behind the tough guy exterior – hanging with his boys and seeking new thrills in speed, guns and other women. He was also constantly looking for reassurance from his fans. He wanted or needed to be top dog. Anyway moral of the story: Don’t do drugs kids – they are bad for you. Still: the rough edge of the artiste! So wrong and yet according to unofficial popular office poll, so right! Is he a complicated man or just a thesp with a knack for addication- who knows, who cares. His demons are for his wife to worry about ( Sorry Mrs Downey Jr- I sure hope you know what you signed up for) for the rest of us; we can but hope that the mainstream devil’s got him by the throat. It was close to midnight and the pre-emptive textmessages and phone calls came trickling in… Well wishes from London, Antwerp, Dublin and Paris. People partying in cool bars, fancy restaurants, or snuggled up on the sofa with partners, or playing boardgames with friends, taking time to contact me. It just showed how friendship comes in different shapes and forms; friends do not need to be near you to still be close. 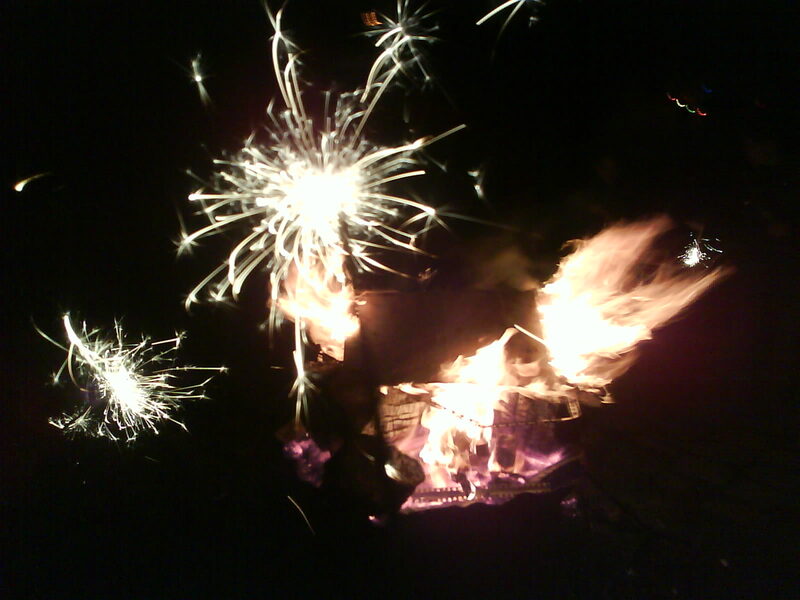 Still as the clock struck twelve I knew I wouldn’t want to be anywhere else than around the campfire just outside a small town with that great group of friends around me. Happy New Year Everyone! Bring on 2010!